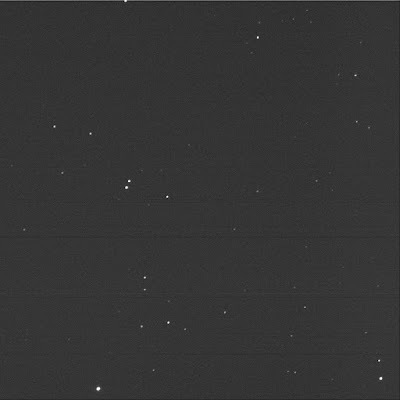 Asked the BGO robot to aim at GSC 02509-0146 near where I thought the neglected double star HJ 3318 might be. In Leo Minor. Thar she blows. Luminance only, 3 seconds subexposures, 10 stacked shots. FITS Liberator, GIMP. North is up; east is left. I selected this pair from the Washington Double Star database. A is to the south; B to the north. HJ 3318 is listed in the WDS as having a theta value of 340 and rho of 24.8. This is very close to the numbers in SkyTools 3 Pro: PA 340° Sep 24.00" (as of 1906). The Interactive Atlas chart displays the stars with the correct orientation and spacing. The chart is nearly a perfect match to the image. In the Object Information box, ST3P says A is magnitude 11.03 and B 9.7. That doesn't seem right. On hovering over the stars in the chart, the numbers are 11.0 and 11.9. The chart shows A as slightly brighter. The WDS says they are mag 9.3 and 9.7 stars. The image gives the impression that B is very slightly dimmer than A. 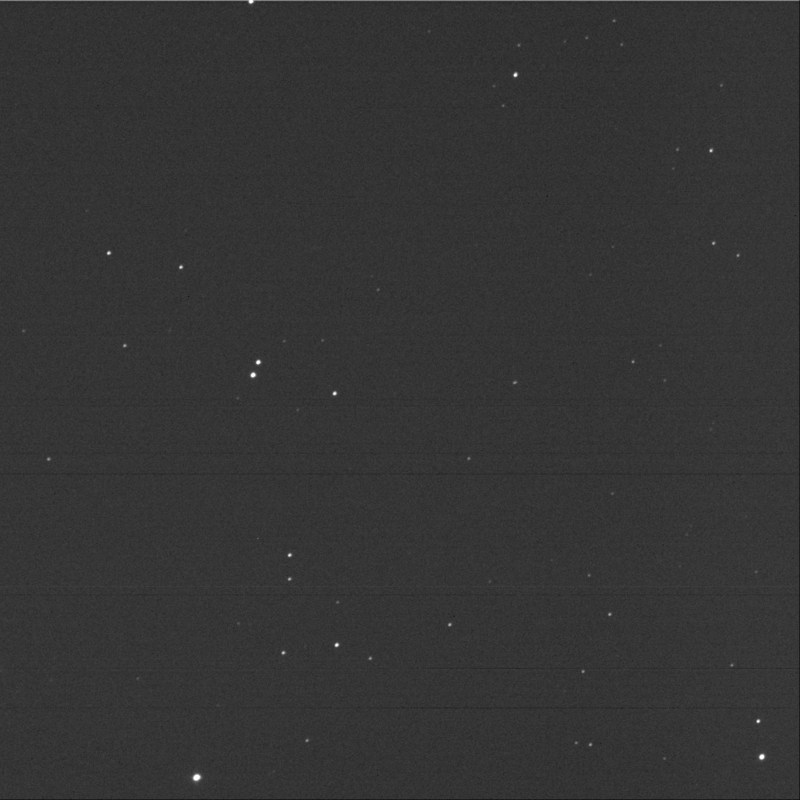 The stars in the image closely match the brightnesses of TYC 02509-0907 1 (11.17) and TYC 02509-0844 1 (11.61) to the north. This leaves me with the impression that the WDS magnitudes are incorrect. The big issue, it seems, is the location. WDS says the pair is at RA 10:02.7 and Dec +36:15. ST3P shows the pair at RA 10:03:42.8 and Dec +36:15:06 (J2000). If I had to say, it looks like the original entry had a transcription error in the Right Ascension, 2 minutes instead of 3. The stars in the image match ST3P. They are between J100338.4+361610 (to the north-west) and J100344.9+361424 (to the south-east).